Henley Taxis specialises in minicab service 24 hours a day, 7 days a week to and from all London Airports. We monitor flight arrivals. Transfers to and from UK Seaports – Dover, Southampton, Harwich and Southampton cruise port to London Airports and various. Henley taxis ltd have been providing reliable airport transfers and local taxi services for the people of Henley on Thames and the surrounding areas since the 1930s. The company now incorporates Talbot Taxis and Airport Select Cars. 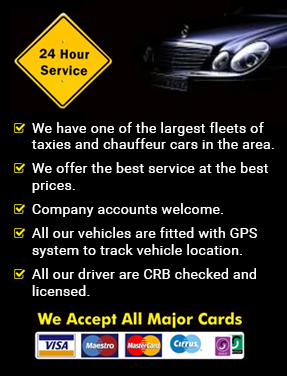 Providing a professional taxi and chauffeur service to the public and has built an excellent reputation for reliability and punctuality whilst providing a very high level of friendly customer service. We provide a genuine prompt 24 hour, 365 days a year through out Henley and the surrounding areas. We have a superior fleet of taxis which include Mercedes Benz, Audi, BMW, people carriers and minibuses. All our taxis are kept immaculately clean and you will find our drivers to be well presented, courteous and helpful.